iCalendar (.ical or .ics file extension) is the most popular file format used to share calendar information over the Internet. 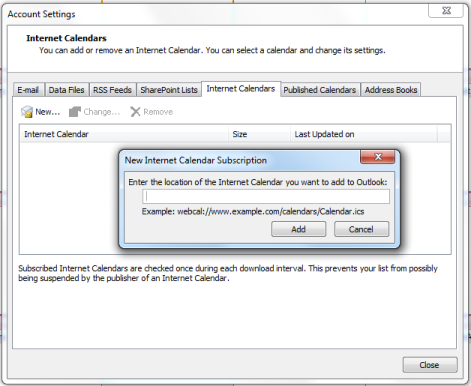 You can subscribe to a calendar using an iCalendar link (URL) within an application or website that supports the iCalendar format. This will provide you with a list of current events and will update the calendar with any changes or future events. Right click on the event type link your would like to subscribe to at the bottom of the calendar on our site and select the option to copy the link. 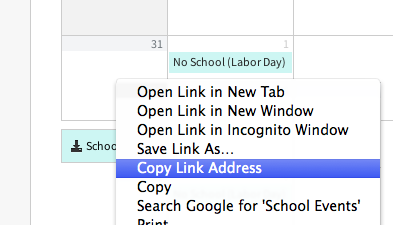 Some browsers will use different titles for this option, such as "Copy Link Address", "Copy Link Location" or simply "Copy Link". Most modern calendar applications and websites support iCalendar feeds. Follow the instructions below for the most popular options. Click here to open Google Calendar in a new tab or window. In the left column, click on the arrow next to "Other Calendars" to display the drop-down menu and then click Add by URL. Paste (ctrl + v or cmd + v) the link copied in step 1 into the URL field then click Add Calendar. Open the Calendar application (formerly named iCalendar). 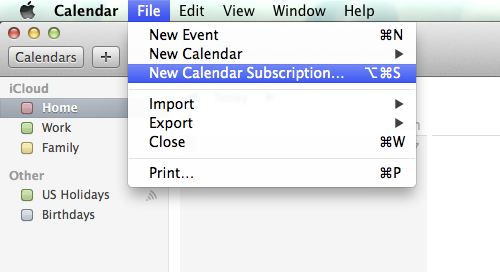 From the File menu select New Calendar Subscription. Paste (cmd + v) the link copied in step 1 into the Calendar URL field and then click Subscribe. Then click OK to add the calendar. From the Tools menu select Account Settings. Click on the Internet Calendars tab. Paste (ctrl + v or cmd + v) the link copied in step 1 into the field and then click Add.